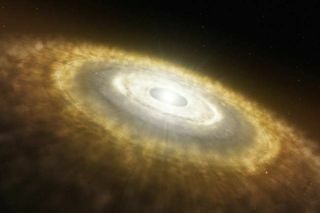 A close-up view of swirling clouds of gas and dust around young stars has given astronomers a new glimpse into how baby solar systems and their planets are formed. After stars are born they usually retain clouds of leftover material around them that condense into rings called protoplanetary disks. Over time, the gas and dust in these disks clump together under the pull of gravity to build planets. In the new study, astronomers peered into a group of nascent solar systems with unprecedented detail by combining the light collected by the two Keck telescopes on Mauna Kea in Hawaii. This allowed them to achieve the extremely fine resolution necessary to observe processes that occur at the border between a star 500 light-years from Earth and its surrounding disk of gas and dust. The view, scientists said, is comparable to standing on a rooftop in Tucson, Ariz., and trying to observe an ant nibbling on a grain of rice in New York?s Central Park on the other side of the United States. "We were able to get really, really close to the star and look right at the interface between the gas-rich protoplanetary disk and the star," said lead researcher Joshua Eisner, an astronomer at the University of Arizona. The researchers looked at 15 young stars with protoplanetary disks in our Milky Way galaxy. All the stars weighed between half and 10 times the mass of the sun. Scientists think gas giant planets can form quickly in only a few million years. After these giants use up most of the gas in the disk, the leftover dust and rock will cluster together to form the rocky terrestrial planets, such as Earth, Mars and Venus. The new observations could also help astronomers understand how stars grow in size by sucking up some of the gas from their surrounding disks. Scientists think stars accrete this matter in two ways. In one method, the gas washes up directly to the surface of the star, and then is incorporated into the star's body. In another mechanism, a star's powerful magnetic field can push away surrounding material, creating an empty envelope between the star and its disk. Atoms from the disk can then accelerate along the magnetic field lines into the star. "Once trapped in the star?s magnetic field, the gas is being funneled along the field lines arching out high above and below the disk?s plane," Eisner explained. "The material then crashes into the star?s polar regions at high velocities." The researchers detail their findings in an upcoming issue of the Astrophysical Journal.